Estyn is the office of Her Majesty’s Chief Inspector of Education and Training in Wales. It is a Crown body, established under the Education Act 1992. Estyn is independent of the National Assembly for Wales but receives its funding from the Welsh Government under Section 104 of the Government of Wales Act 1998. 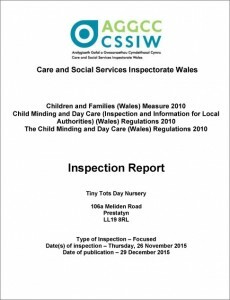 Estyn inspects quality and standards in education and training providers in Wales. We as a nursery are proud to have been awarded the highest level of achievement (level 3) indicating Tiny Tots provides an exemplary childcare service for all our children in our care. Please ask us for a copy of our latest e-QUALITY COUNTS NDNA Accreditation report. 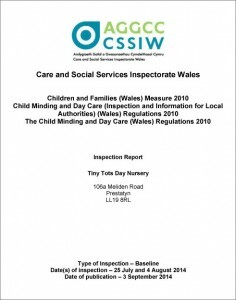 Their role is to make professional inspections and judgements about social care, early years and social services and so encourage improvement by the service providers.